The Bears have been dominating all season, so much that several pundits and college football experts believe they should be the No. 1 ranked team in the AP Top 25 poll instead of Ohio State. On Saturday, the men from Texas will welcome Iowa State to McLane Stadium in Waco, and they are favourites to remain undefeated in the campaign. Baylor is ranked No. 1 in the country for points per game, at 64, while sitting second in rushing yards per game, at 348.7. Quarterback Seth Russell has been one of the main headliners for the Bears this season — passing for 1907 yards and 27 touchdowns with a 93.0 QBR. 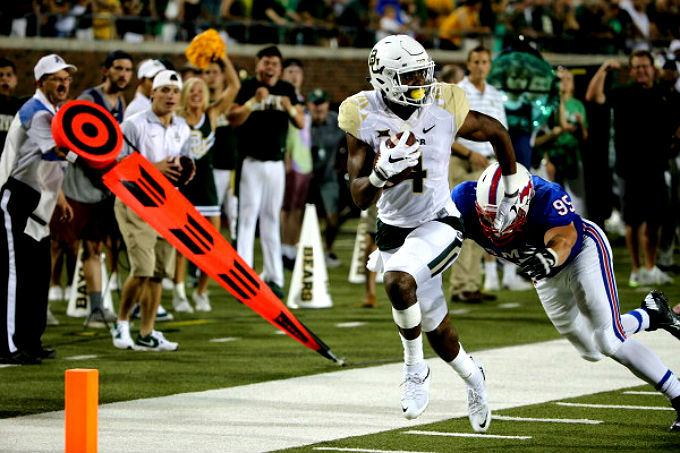 Wide receiver Corey Coleman is also having a remarkable season for Baylor – taking 41 receptions for 877 yards and scoring 16 touchdowns, while running back Shock Linwood has run for 803 yards and eight scores so far this season. The Cyclones have dropped their last two games and four of the last five contest. Baylor is 6-0 on the season overall and 3-0 in Big 12, with Iowa State at 2-4, 1-2. No. 17 Oklahoma will be trying to avoid another slip up against Texas opponents this term when it plays host to Texas Tech at Memorial Stadium in Norman, on Saturday. The Sooners (5-1, 2-1) were shocked by the Texas Longhorns in the Red River Showdown earlier this month and will be hoping to get things right this time out. Texas Tech (5-2, 2-2) has won its last two games, vaulting from back-to-back defeats to Baylor and TCU. The Red Raiders clash with the Sooners this weekend starts at 2:30 p.m. CT and is live on ABC, ESPN2 and streaming live on the WatchESPN App. Elsewhere in Big 12 college football action in Week 8, No. 14 Oklahoma State is the heavy favourite to beat the struggling Kansas, while Kansas State are at Texas. The Jayhawks, who have given up 96 points in two games, including 66 against the Baylor Bears, are 0-6 on the season overall and 0-3 in Big 12. The Cowboys are 6-0 overall and 3-0 in Big 12. No. 4 TCU and West Virginia are idle until Week 9.